Greek for brunch? We have no problem ditching the plain old flapjacks if baklava pancakes are involved, and Elysian Fields Cafe offers that — and so much more. 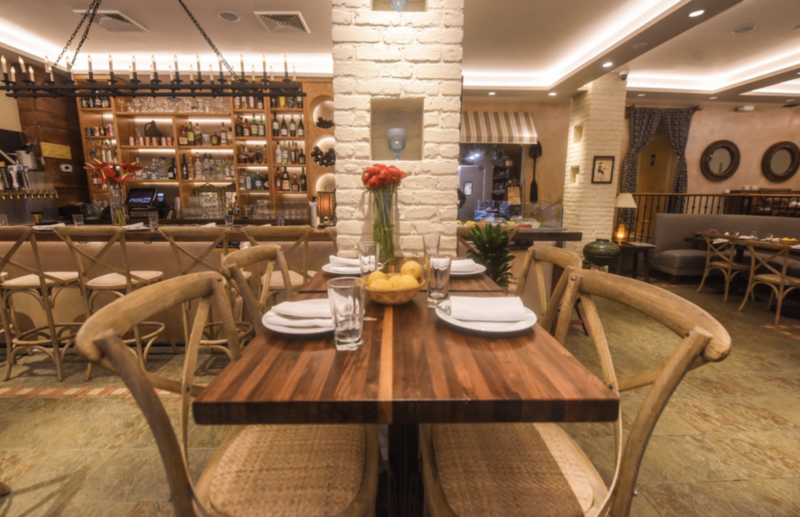 The rustic Greek restaurant, which sits atop a steep slope in Harlem, is the exact place to go for incredible souvlaki platters, large slabs of spanakopita, fresh seafood and beyond. My guest and I arrived on a peachy, bright Saturday morning ready to brunch to our heart’s content, and boy, did Elysian Fields Cafe deliver. Upon walking in, we noticed the space was airy and expansive with bowls of lemons nestling comfortably atop bright wood tables. Soft colors contrasted with brick walls and bookshelves were built into the walls, showcasing a few favorites. We also saw a separate wine cellar-like seating level that looked like the perfect spot for a cozy, rainy day. Our host came right over to us and started us out with a few cocktails — for me, the bloody mary ($10) and my guest opting for the day’s special drink. They swiftly arrived, beautifully presented and generous, and while mine was that spicy-savory-rich flavor combination bloody mary’s should have, my guest’s drink included grapefruit vodka, grapefruit, lemon, simple syrup and Champagne — super light and refreshing. We barely took a look at the food menu before asking our host what stood out to him as major contenders, and he knew exactly where to point us. We opted for the trio of spreads ($11.95) and the spanakopita ($11.95). 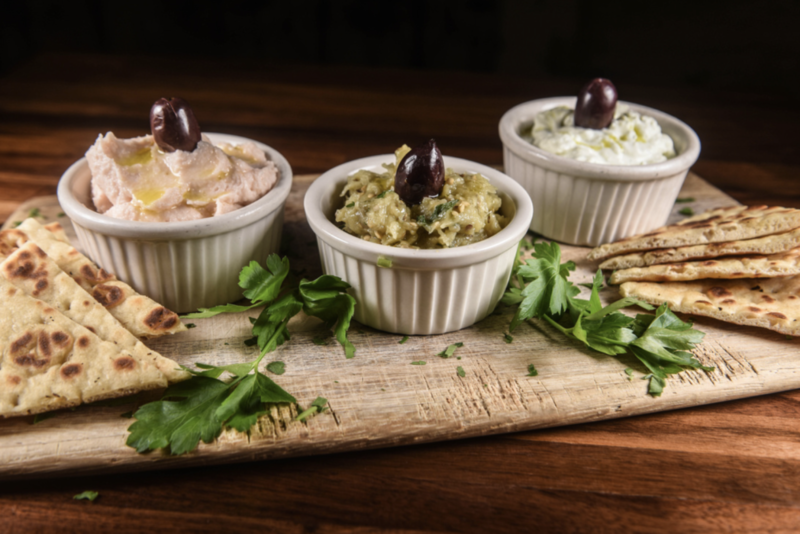 The trio, which included tzatziki, taramasalata (roasted eggplant) and melitzana (a wonderful caviar spread) were entirely complementary to each other and served with charred, fluffy herbed bread. The spanakopita was everything you wish for it to be — comforting, rich, creamy and savory with a bite of saltiness from feta. We could’ve stopped there, but why would we, right? For mains, we gravitated toward the Elysian eggs ($12.95), which included three organic eggs, fries and feta, and the baklava pancakes ($13.95) with Greek honey and toasted walnuts. We absolutely shared, because what’s better than having a little salty and sweet tastes together? 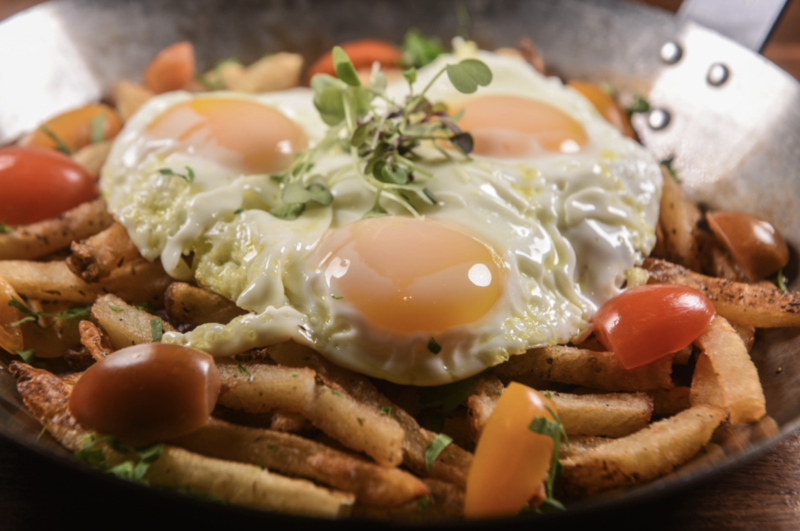 The eggs dish was savory and comforting with crispy fries and perfectly runny eggs while the pancakes were rich and caramelized but not too sweet with soft-as-heaven pancakes. We couldn’t have been more satisfied. If we had our choice of any brunch spot in the city, Elysian Fields Cafe would be one of our top options. Between the well-priced drinks, the tantalizing Greek fare and the classic entree favorites, there’s nothing that this restaurant is missing. Even better: Those baklava pancakes will have you forgetting all about those plain jane hotcakes the second they hit your mouth. Trust us on that one.